The Vietnam War took place from 1955 to 1975, a struggle between communist North Vietnam and South Vietnam, which was allied with the West. In 1960, the National Liberation Front for the Liberation of South Vietnam (NLF, or colloquially, ‘Viet Cong’) was established as a communist insurgency against US military presence in South Vietnam. At the height of the Cold War, the war in Vietnam was a proxy in the wider struggle between communist countries and the West. The role of western powers in the war was strongly opposed by left-wing groups in the West, where it was seen as a symbol of American imperialist aggression. Gaining popular support, it became the cause célèbre of a strong anti-militarism movement throughout the late 1960s, leading to large protests which were also part of a general radicalisation of student politics. The Vietnam Solidarity Campaign (VSC) was founded in 1966 by members of International Marxist Group in conjunction with the Bertrand Russell Peace Foundation. They were joined by activists from the International Socialists – later renamed the Socialist Workers Party. Ian H. Birchall, History of the International Socialists – Part 2: Towards a Revolutionary Party, International Socialism 77 (1st series), April 1975 (accessed via Marxists.de, 8 August 2017). Both the IMG and the IS/SWP were Trotskyist, and subsequently subjected to long term police monitoring, including infiltration by undercover police. The VSC was one of several groups opposing the Vietnam War as different political traditions on the left created their own organisations to oppose the war. However, though mainly Trotskyist, the VSC emerged as the leading group, and from 1967 to 1969 dominated campaigns protesting against western involvement in Vietnam. This success was partly because it had expanded outside the Trotskyist milieu by focusing on building a mass movement through assembling a broad coalition that included Maoists, anarchists and communists. It was particularly successful in linking up with the prominent radical student movement of 1967 to 1969 as well as peace / anti-nuclear campaigners. This remarkable outreach was achieved through the use of ‘ad hoc committees’, on both national and local levels, to minimise political differences through a series of temporary alliances. Albeit, this alliance of quite different political viewpoints would cause considerable tension and debate.Ernest Tate &amp; Phil Hearse, The Building of the Vietnam Solidarity Campaign and its Consequences for the British Left, paper presented at the Left Before 1968 conference, University of East Anglia, February 2016 (accessed via Marxsite.org, 8 August 2017).Theresa van Geldern, Vietnam Solidarity: The determination to resist and the confidence to win, Socialist Outlook, May/June 1988. As an organisation, it was a mixture of a tight core group at the heart of a much looser structure. It had an elected national committee which set national strategy; this committee was mainly made up of IMG and IS people, though had others from the left also on it. However, much of the administrative / publication side of things was conducted by IMG members. Initially local branches across the UK were organised through IMG groups, but this later expanded as the campaign caught the national imagination. The VSC is most notable for organising mass demonstrations against the war in 1967 and 1968, which attracted up to 100,000 protestors.Anthony O. Edmonds, The Viet Nam War and the British Student Left: A Study in Political Symbolism, Vietnam Generation: A Journal of Recent History and Contemporary Issues, Issue 5 (14), 1994 (accessed 8 August 2017). Of note was the protest of 17 March 1968, which saw the infamous ‘Grosvenor Square riots’ take place – when the marchers sought to occupy the US embassy leading to clashes with police.1968: Anti-Vietnam demo turns violent, BBC News Online (‘On This Day’), 2008 (accessed 6 August 2017). This caused huge political embarrassment to the UK Labour Government of the day, under Harold Wilson, and the political fallout, particularly with the impending demonstration of 27 October 1968, gave impetuous for the founding of the Special Demonstration Squad. However, despite its considerable success, the VSC was unable to sustain the momentum and also suffered from political differences within it. The campaign declined rapidly in 1969, and in October that year the coalition effectively disintegrated. An understanding of the inner workings of the Vietnam Solidarity Campaign and how it was targeted by police requires an overview of each of the political groups active at the time. We go into a bit more detail here than strictly necessary, as many of the groups continued to be targeted by the Special Demonstration Squad and form part of that history throughout the 1970s. Indeed, the basis of many subsequent deployments can be traced back to the initial infiltrations of September 1968. Much of the material in this section, and others is drawn from Ernest Tate, Revolutionary Activism in the 1950s and 1960s, Volume 2, Resistance Books, 2014. The International Group was founded in Nottingham in 1961 by Pat Jordan and Ken Coates, who had split from the Revolutionary Socialist League (a forerunner of Militant / Socialist Party). It was Trotskyist in outlook and aligned itself with the Fourth International, the world-wide Trotskyist organisation. It was never a particularly large group, but did establish branches in Hull and Scotland. At some point, it renamed itself the International Marxist Group (IMG), by which it is much better known. It had a bookshop in Nottingham, which served as a focal point for its activism, and produced a newssheet, The Week – replaced in 1968 by The Internationalist. In terms of membership, the IMG was a cadre organisation in that one did not simply join up, but went through a formal acceptance programme, including education in its theoretical positions. Initially, the group focused on entryism within the Labour Party and doing work through the Institute of Workers Control. Through its activities with the Fourth International, it was able to tap into international networks of political groups that brought significant political contacts among communist countries, many of whose national liberation struggles it was vocal in supporting, including Cuba as well as Vietnam. The Fourth International also gave the IMG access to leading international figures such as Ernest Mandel and Rudi Dutschke. When the decision to found the Vietnam Solidarity Campaign was taken in 1965, a number of the IMG’s people moved to London to work on it. This led to a London branch being established at the end of 1966; its energy and politics attracted disillusioned activists from other parties, allowing its activities to expand. The branch was focused around Ernest Tate and Jess McKenzie, two Canadian organisers, whose Streatham home was commonly used by Fourth International visitors from abroad. McKenzie was the coordinator of the London branch until mid-1968, with meetings taking place weekly. In 1966, Tate established a bookshop at 8 Toynbee Street, East London called Pioneer Book Service. Above it, Pat Jordan took an office, from where he published The Week and which acted as a hub for IMG activities.Mike Martin, Guest post: A short account of the International Marxist Group, RevolutionaryHistory.co.uk, 17 December 2017 (accessed 12 January 2018). The IMG was at the heart of the Trotskyist milieu in London and associated with leading publications and organisations at the time, often through considerable overlap in individuals. These connections included the Revolutionary Socialist Students’ Federation and the leading left-wing publications, New Left Review and Black Dwarf, though these were not official outlets of the organisation. It also closely associated with the International Socialists under Tony Cliff, and both groups collaborated within the VSC. With the success of the anti-war protest and able to access the increasingly radical student politics, the IMG grew, though it maintained a single London branch for organising purposes. However, in 1968 it had reading groups in West Middlesex, South & North London and held a cadre school of 100 people that summer. Nevertheless, autumn 1968 also saw new problems within the IMG London branch, with some dissatisfied by the focus on anti-war issues and wanting to move away from this. This resulted in several long-standing members leaving – in 1970 they and others formed the Revolutionary Communist League. Though much of its energy in London was focused on the VSC, the International Marxist Group also organised public meetings on other issues either as the IMG / The Week, or in the name of the Fourth International. One such meeting was in April 1968 with Ernest Mandel speaking there. Another, of 8 September, hosted a talk by the US socialist activist Fred Halstead.John London, Fred Halstead speaks on G.I. anti-war mood, International (newsletter of the International Marxist Group), Vol. 1, No.6, October 1968 (accessed via Marxists.org). However, at the end of the decade it moved on to organising around other issues, such as the Women’s Liberation movement. In 1970 it set up its youth wing, Spartacus League, which focused on anti-apartheid campaigning.Peter Henessy, The Secret State: Preparing For The Worst 1945 – 2010, Penguin, 2014. Though over the years various factions departed, the IMG continued as an organisation until 1982, when it became Socialist League (better known as Socialist Action, which was actually its then newspaper). It finally fractured into three groups in 1985.Internationalist Marxist Group, Wikipedia, undated (accessed 8 February 2018).Pat Jordan (writing as Peter Peterson), Aspects of the History of the International Marxist Group], May 1972 (accessed via RedMoleRising)Peter Gowan (writing as ‘Klein’), The Development of the IMG and its Leadership, unpublished internal document of International Marxist Group, mid-1970s (accessed via RedMoleRising)Mike Martin, Guest post: A short account of the International Marxist Group, RedMoleRising, 17 December 2015 (accessed 8 February 2018). The Bertrand Russell Peace Foundation (BRPF) was founded by the philosopher and campaigner Bertrand Russell in 1963. Russell had been a long-time peace and nuclear disarmament activist. The BRPF was run by Russell’s then private secretary, Ralph Schoenman. The Foundation had rented offices at 3-4 Shavers Place, SW1 near Piccadilly Circus in central London, before purchasing its own place at 49 Rivington Place in Shoreditch, EC2. From early on it was closely connected with people active in the IMG, and the history of the two organisations and the VSC have to be considered together in the period 1965-1968. It was at meetings organised by the BRPF that the Vietnam Solidarity Campaign was first proposed and the Foundation provided considerable resources permitting its establishment. At the same time, the Foundation also set up the Russell Tribunal / International War Crimes Tribunal to examine the actions of US military in Vietnam. IMG members provided much of the behind-the-scenes administrative work as well as international contacts to make the Tribunal happen. As time went on, the Foundation not only employed IMG members as staff, but leaders of IMG were also appointed to the Board of Directors. In 1967 the BRPF began to run into financial problems having over-extended itself financially on the Tribunal. This was exacerbated by Ralph Schoenman, having travelled to Bolivia in the wake of the killing of Che Guevara, but being denied entry back into the UK (he was an American). This lead to a crisis point in mid-1968, when Ken Coates took charge of the BRPF and its assets (see below), and removed the other IMG people from their positions in the Foundation. Coates continued the work on the Tribunal, but this effectively severed the ties between the Foundation and the Vietnam Solidarity Campaign. Coates in turn was expelled from the IMG, but continued to run the Foundation until his death in 2010, basing it in Nottingham where it still exists. The New Left Review is a political science magazine founded in 1960 by Stuart Hall. Marxist in outlook but covering a wide range of issues and opinions across the left, it has held an influential position in British left-wing politics for many years, publishing articles by leading Marxists.Duncan Thompson, Pessimism of the Intellect? A History of New Left Review, 2007, The Merlin Press Ltd.Ian Birchall, The autonomy of theory: A short history of New Left Review, Autumn 1980, International Socialism, Series 2, Issue 10 (accessed via Marxists.org). The NLR was a small but leading part of the Trotskyist milieu at the time, with a number of its board of editors being organisers with IMG, the International Socialists and the Revolutionary Socialists Students Federation. Its active support of the Vietnam Solidarity Campaign helped mobilise the left around the issue. One of its editors was Tariq Ali, who emerged as a leading spokesperson for the VSC (though he only joined the IMG in 1968). Ali also set up Black Dwarf, a popular publication at the time, which became closely associated with the IMG.Gregory Elliot, Perry Anderson: The Merciless Laboratory of History, 1998, University of Minnesota Press.Tendance Coatesy, New Left Review at Fifty: Is There Life in Their Politics?, TendanceCoatesy.Wordpress.com (Blog), 19 February 2010 (accessed 6 August 2017).Martin Klimke &amp; Joachim Scharloth, 1968 in Europe: A History of Protest and Activism, 1956–1977, 2008, Springer. Led by Tony Cliff, the International Socialists (I.S.) had existed since 1950. It came from a somewhat different Trotskyist tradition than the IMG, though both traced their origins back to the Revolutionary Communist Party of the 1940s.Know Your Trots: Family Tree of Trotskyist groups in the UK and their offshoots, undated, SplitsAndFusions.wordpress.com (accessed 10 February 2018). They were sufficiently close to the IMG in politics that in June 1968 a merger between the two groups was floated, albeit the approach was rebuffed by the IMG. Tate recalled that throughout 1968 the I.S. and IMG had a close working relationship. The groups met in Spring 68 for an exchange of views ahead of the May 1968 VSC National Conference in order to get a common slate for the VSC National Executive. IMG members would join I.S. buses to go to conferences. Members of the IMG and I.S. were also active in many of the same groups such as the New Left Review and the Revolutionary Socialists Students Federation. However, in the 1960s the International Socialists were still a small player within the left, though that changed in the wake of 1968, when it did well recruiting from the increasingly radical campus politics of the time. Initially as an organisation, the I.S. took a wait-and-see approach to the VSC, though leading members were supportive. Chris Harman joined the VSC’s national committee and became the International Socialist’s coordinator on matters relating to the Vietnam War; others of its activists were involved on the VSC’s local branch committees. In 1966 it also organised a trade union conference on Vietnam.Ian Brichall, History of the International Socialists Part 2: Towards a revolutionary party, April 1976, International Socialism, No. 77 (via Marxists.org). It changed its name to the Socialist Workers Party in the 1970s. 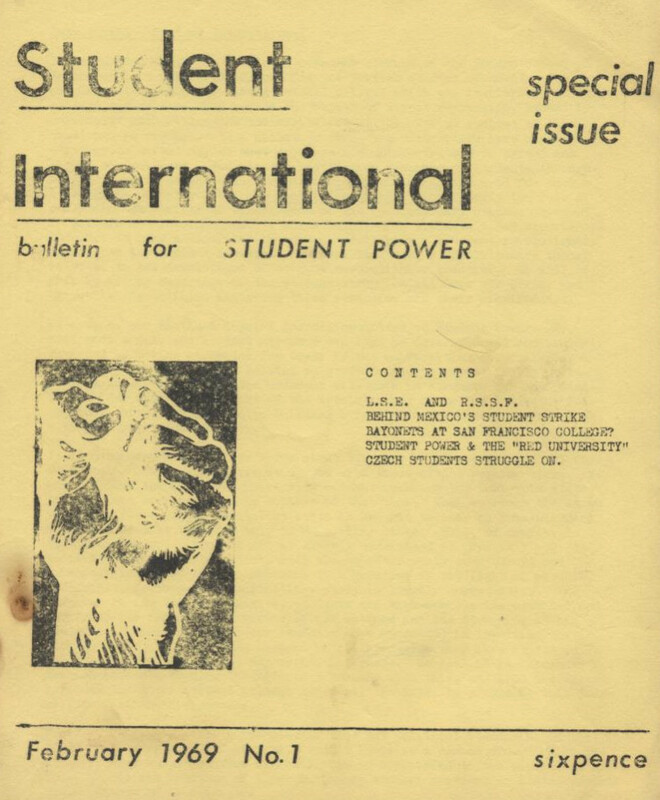 Student International, Issue 1, February 1969 – bulletin of the R.S.S.F. A late arrival on the political scene, The Revolutionary Socialist Students’ Federation was founded at the London School of Economics in June 1968, inspired by the student uprising in France that year. It was made up of various student socialist societies, mainly Trotskyist’ and Maoist’, and attracted prominent socialist activists including leading Vietnam Solidarity Campaign activists. It sought to be a radical counter-weight to the National Union of Students. A contemporary report noted of a press conference announcing the launch of the organisation that: ‘It would not be committed to violence, though it might be necessary on occasion… that RSSF was more concerned with revolution in capitalist society as a whole than in mere student power. 'Peter Gowan, L.S.E. and R.S.S.F., Student International, Issue 1, February 1969 (accessed via Red Mole Archives).Barbara Ehrenreich & John Ehrenreich, Long March, short spring: the student uprising at home and abroad, Monthly Review Press, 1969.Papers of Richard Kuper (International Socialism Group / Socialist Workers Party), Modern Records Centre, Warwick University, catalogue entry (accessed 6 August 2017).Di Parkin, A Revolutionary Schoolgirl of the 1960s: Meeting report, Bristol Radical History Group, notes of talk of 9 March 2016 (accessed 6 August 2017).Geoff Andrews, History of the Communist Party, Vol 6, Lawrence & Wishart, 2004.Richard Bourne, From the archive, 15 June 1968: British students talk about a revolution, The Guardian, 15 June 1968, republished 15 June 2013 (accessed 6 July 2017). Circa August 1968, the RSSF moved its address to 120 Commercial Road, E1,Conrad Dixon, VSC “Autumn Offensive” (weekly report), Metropolitan Police Special Branch, 3 October 1968 (accessed via SpecialBranchFiles.UK). where the VSC had moved its office the previous month.Contents, Vietnam Solidarity Campaign Bulletin, Issue 16, July 1968 (accessed via Marxists.org). The heart of the RSSF was focused on the London School of Economics, a central place in the radical student movements and the anti-Vietnam war protests in the late 1960s. In October 1968, some 3000 students occupied the LSE following an attempt by management to close the university ahead of the 27 October anti-Vietnam War demonstration. During this occupation, the LSE was used as a base for the protests, including a medical centre established by the Socialist Medical Association. The occupations of the university in late 1968 and early 1969 received considerable press and police interest. Numerous arrests took place, and legal action was taken against student ‘ringleaders’. NLR editors who also served as staff at the London School of Economics were subsequently dismissed from their jobs over their support of the student occupations. ON THIS DAY: 1969: LSE closes over student clashes, BBC Online, 2008 (accessed 10 February 2018). However, the RSSF was a relatively short-lived organisation holding only three national conferences, its second being on 10 November 1968 in London.At this conference it adopted its manifesto – see: Revolutionary Socialist Students’ Federation: RSSF Manifesto, first published in the New Left Review, Issue 53, Jan/Feb 1969; re-published by SocialismToday, Issue 118, May 2008.A third conference was to be held in March 1969 Suffering splits, it did not survive beyond 1969. Nevertheless, the RSSF was influential in subsequent left-wing student / campus organisations, and a notable recruiting ground for the various Communist, Trotskyist and Maoist groups – numerous individuals who went on to lead far left groups in the 1970s became politically active through the RSSF.The Second Wave: the Radical Youth Wants a Party: The Late 1960s – Index Page, Marxists.org, undated (accessed 6 August 2017). 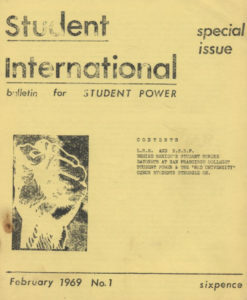 Reports of its activities were captured in the three issues of the short-lived journal Student International.The three issue of ‘Student International – the Bulletin for Student Power!’ have been archived by The Red Mole website at Issue 1 (Feb 1969), Issue 2 (March 1969), Issue 3 (June 1969). It also briefly issued its own journal, Escalate.Some sources also call it ‘Revolution’ or ‘The London Journal of the Revolutionary Socialist Students Federation’. Apart from the Trotskyist / Maoist RSSF, there also existed the Communist Party dominated Radical Student Alliance. The leading Maoist group active in the late 1960s was the Revolutionary Marxist-Leninist League under by Abhimanyu Manchanda. They had attended the opening conference of the Vietnam Solidarity Campaign in 1966, but, not unexpectedly, walked out over political disagreements. As one author wrote:1968, Grosvenor Square – that’s where the protest should be made, WoodsmokeBlog, 18 August 2017 (accessed 10 February 2018). As a result of this walk-out, the British Vietnam Solidarity Front (BVSF) was formed. Based at Manchanda’s Hampstead flat, it would become the main alternative to the VSC in terms of supporting the armed struggle of the National Liberation Front of South Vietnam.1968, Grosvenor Square – that’s where the protest should be made, WoodsmokeBlog, 18 August 2017 (accessed 10 February 2018). However, it never gained the same size or status, and only really got off the ground in 1968. It often mirrored the activities of the VSC, maintaining a close interest in the latter organisation, including attending the large demonstrations and becoming involved in the local ad hoc committee meetings. Issue 1 of the British Vietnam Solidarity Front bulletin, 1968. In 1968, the Front lead the demonstration of 21 July.1968, Grosvenor Square – that’s where the protest should be made, WoodsmokeBlog, 18 August 2017 (accessed 10 February 2018). It initially joined the VSC’s 27 October Ad Hoc Committee but was subsequently excluded and founded its own committee in response.Editorial Statement, International (newsletter of the International Marxist Group), Vol. 1, No.5, September 1968 (accessed via Marxists.org). On the day of 27 October it was involved in clashes with police when it led a breakaway section from the main march to its preferred target, the US Embassy.Mary McCarthy, Letter from London: The Demo, ”New York Review of Books”, Vol. 11, No. 11, 19 December 1968 (accessed via the AbhimanyuManchandaRemembered.weebly.com website, 10 February 2018). As with the VSC, the BVSF went into decline after October 1968. It is not yet known the extent to which the BVSF was spied upon in that year 1968, but groups that came from the milieu around Manchanda, such as Women’s Liberation Front, were subsequently targeted by SDS undercovers.See for example, “Sandra” who infiltrated the Women’s Liberation Front in 1972-73. See Undercover Research Group, HN348, Powerbase.info, 2018 (accessed 10 March 2018). 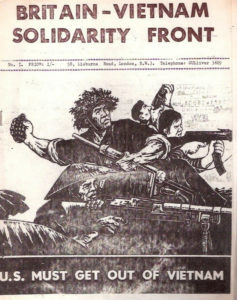 Likewise, the group behind the BVSF, the Revolutionary Marxist-Leninist League, also suffered splits including in September 1969, when Edward Davoren, convener of the London RSSF and active in the BVSF, broke away to form the Irish National Liberation Solidarity Front Sam Richards, The Rise &amp; Fall of Maoism: the English Experience, Encyclopedia of Anti-Revisionism Online, undated (accessed via Marxists.org). – itself subsequently the target of SDS undercover ‘Alex Sloan’ in the early 1970s. ‘Alex Sloan’ was deployed by the Special Demonstration Squad into the Irish National Liberation Solidarity Front 1971-1973. See N officers, page 3, Undercover Research Group, 2018 (accessed via powerbase.info). 1. ↑ Ian H. Birchall, History of the International Socialists – Part 2: Towards a Revolutionary Party, International Socialism 77 (1st series), April 1975 (accessed via Marxists.de, 8 August 2017). 2. ↑ Ernest Tate &amp; Phil Hearse, The Building of the Vietnam Solidarity Campaign and its Consequences for the British Left, paper presented at the Left Before 1968 conference, University of East Anglia, February 2016 (accessed via Marxsite.org, 8 August 2017). 3. ↑ Theresa van Geldern, Vietnam Solidarity: The determination to resist and the confidence to win, Socialist Outlook, May/June 1988. 4. ↑ Anthony O. Edmonds, The Viet Nam War and the British Student Left: A Study in Political Symbolism, Vietnam Generation: A Journal of Recent History and Contemporary Issues, Issue 5 (14), 1994 (accessed 8 August 2017). 5. ↑ 1968: Anti-Vietnam demo turns violent, BBC News Online (‘On This Day’), 2008 (accessed 6 August 2017). 6. ↑ Mike Martin, Guest post: A short account of the International Marxist Group, RevolutionaryHistory.co.uk, 17 December 2017 (accessed 12 January 2018). 7. ↑ John London, Fred Halstead speaks on G.I. anti-war mood, International (newsletter of the International Marxist Group), Vol. 1, No.6, October 1968 (accessed via Marxists.org). 8. ↑ Peter Henessy, The Secret State: Preparing For The Worst 1945 – 2010, Penguin, 2014. 9. ↑ Internationalist Marxist Group, Wikipedia, undated (accessed 8 February 2018). 12. ↑ Mike Martin, Guest post: A short account of the International Marxist Group, RedMoleRising, 17 December 2015 (accessed 8 February 2018). 13. ↑ Duncan Thompson, Pessimism of the Intellect? A History of New Left Review, 2007, The Merlin Press Ltd.
14. ↑ Ian Birchall, The autonomy of theory: A short history of New Left Review, Autumn 1980, International Socialism, Series 2, Issue 10 (accessed via Marxists.org). 15. ↑ Gregory Elliot, Perry Anderson: The Merciless Laboratory of History, 1998, University of Minnesota Press. 16. ↑ Tendance Coatesy, New Left Review at Fifty: Is There Life in Their Politics?, TendanceCoatesy.Wordpress.com (Blog), 19 February 2010 (accessed 6 August 2017). 17. ↑ Martin Klimke &amp; Joachim Scharloth, 1968 in Europe: A History of Protest and Activism, 1956–1977, 2008, Springer. 18. ↑ Know Your Trots: Family Tree of Trotskyist groups in the UK and their offshoots, undated, SplitsAndFusions.wordpress.com (accessed 10 February 2018). 19. ↑ Ian Brichall, History of the International Socialists Part 2: Towards a revolutionary party, April 1976, International Socialism, No. 77 (via Marxists.org). 20. ↑ Peter Gowan, L.S.E. and R.S.S.F., Student International, Issue 1, February 1969 (accessed via Red Mole Archives). 21. ↑ Barbara Ehrenreich & John Ehrenreich, Long March, short spring: the student uprising at home and abroad, Monthly Review Press, 1969. 22. ↑ Papers of Richard Kuper (International Socialism Group / Socialist Workers Party), Modern Records Centre, Warwick University, catalogue entry (accessed 6 August 2017). 23. ↑ Di Parkin, A Revolutionary Schoolgirl of the 1960s: Meeting report, Bristol Radical History Group, notes of talk of 9 March 2016 (accessed 6 August 2017). 24. ↑ Geoff Andrews, History of the Communist Party, Vol 6, Lawrence & Wishart, 2004. 25. ↑ Richard Bourne, From the archive, 15 June 1968: British students talk about a revolution, The Guardian, 15 June 1968, republished 15 June 2013 (accessed 6 July 2017). 26. ↑ Conrad Dixon, VSC “Autumn Offensive” (weekly report), Metropolitan Police Special Branch, 3 October 1968 (accessed via SpecialBranchFiles.UK). 27. ↑ Contents, Vietnam Solidarity Campaign Bulletin, Issue 16, July 1968 (accessed via Marxists.org). 28. ↑ ON THIS DAY: 1969: LSE closes over student clashes, BBC Online, 2008 (accessed 10 February 2018). 29. ↑ At this conference it adopted its manifesto – see: Revolutionary Socialist Students’ Federation: RSSF Manifesto, first published in the New Left Review, Issue 53, Jan/Feb 1969; re-published by SocialismToday, Issue 118, May 2008. 31. ↑ The Second Wave: the Radical Youth Wants a Party: The Late 1960s – Index Page, Marxists.org, undated (accessed 6 August 2017). 32. ↑ The three issue of ‘Student International – the Bulletin for Student Power!’ have been archived by The Red Mole website at Issue 1 (Feb 1969), Issue 2 (March 1969), Issue 3 (June 1969). 33. ↑ Some sources also call it ‘Revolution’ or ‘The London Journal of the Revolutionary Socialist Students Federation’. 34, 35, 36. ↑ 1968, Grosvenor Square – that’s where the protest should be made, WoodsmokeBlog, 18 August 2017 (accessed 10 February 2018). 37. ↑ Editorial Statement, International (newsletter of the International Marxist Group), Vol. 1, No.5, September 1968 (accessed via Marxists.org). 38. ↑ Mary McCarthy, Letter from London: The Demo, ”New York Review of Books”, Vol. 11, No. 11, 19 December 1968 (accessed via the AbhimanyuManchandaRemembered.weebly.com website, 10 February 2018). 39. ↑ See for example, “Sandra” who infiltrated the Women’s Liberation Front in 1972-73. See Undercover Research Group, HN348, Powerbase.info, 2018 (accessed 10 March 2018). 40. ↑ Sam Richards, The Rise &amp; Fall of Maoism: the English Experience, Encyclopedia of Anti-Revisionism Online, undated (accessed via Marxists.org). 41. ↑ ‘Alex Sloan’ was deployed by the Special Demonstration Squad into the Irish National Liberation Solidarity Front 1971-1973. See N officers, page 3, Undercover Research Group, 2018 (accessed via powerbase.info).